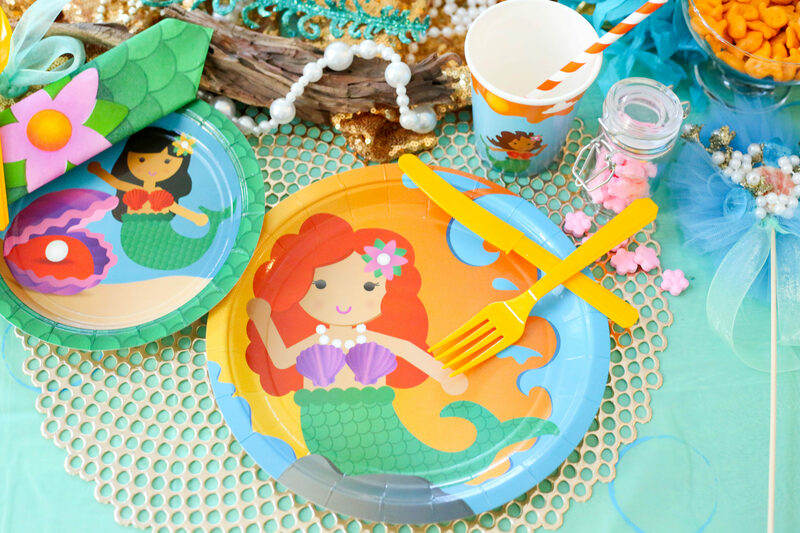 Love a good mermaid party? 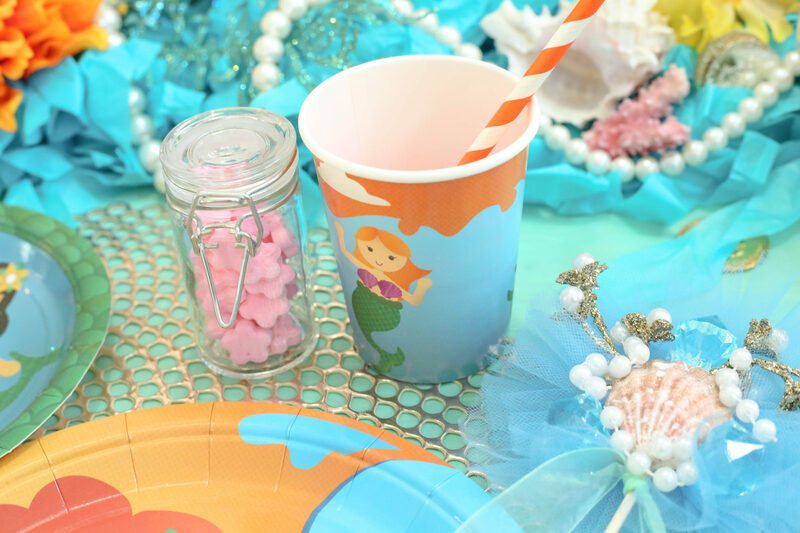 Splish splash, it’s a mermaid bash! 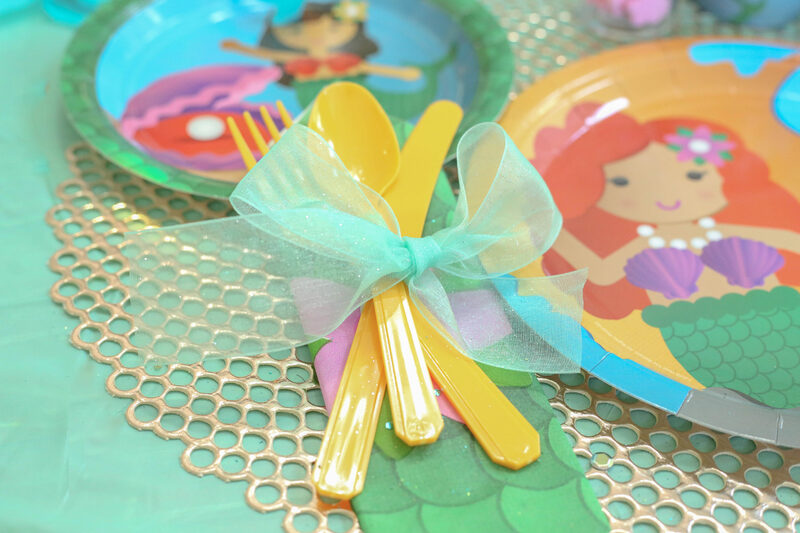 Happy little mermaids are bubbling by for a party filled with fun and wonder from under the sea. 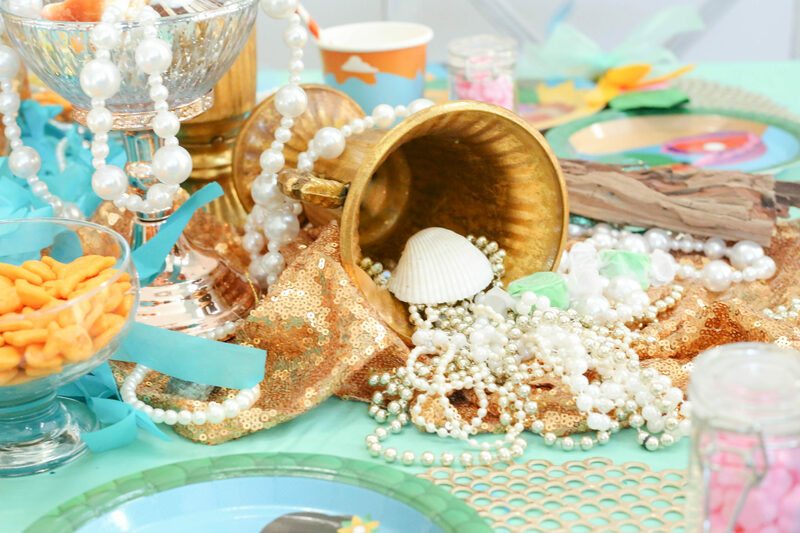 Swim along with us to a table filled with unique mermaid party details that you’ll flip for, like a treasure box filled with candy, a sparkling mermaid wand, and a crown just for the guest of honor. 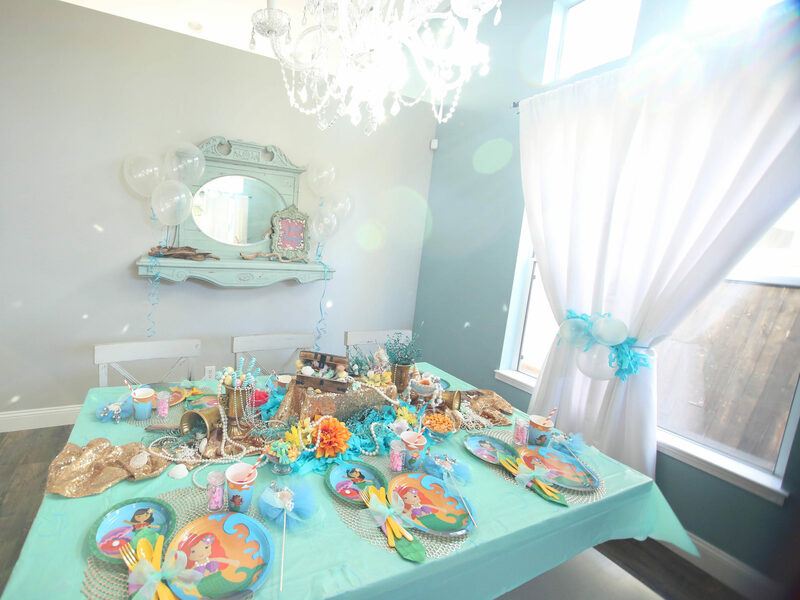 The table is laid with a Caribbean green tablecloth, creating the perfect base layer for this oceanic tablescape. Next, a glittering gold sequined table runner is bunched and draped across the center of the table. A simple cardboard box elevates the center, and is covered by the gold runner. Then, layers of fluffy turquoise tissue garland are tucked around the base. 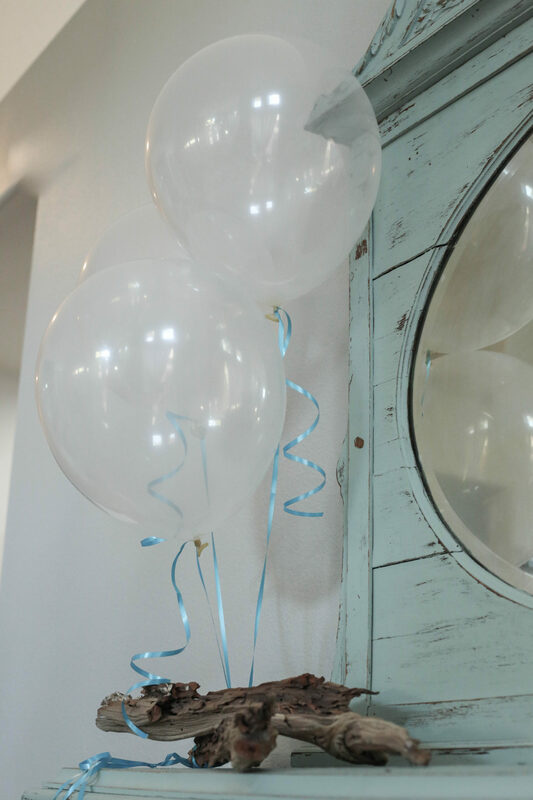 This would be a great place for a personalized birthday sign, if you chose to add one. 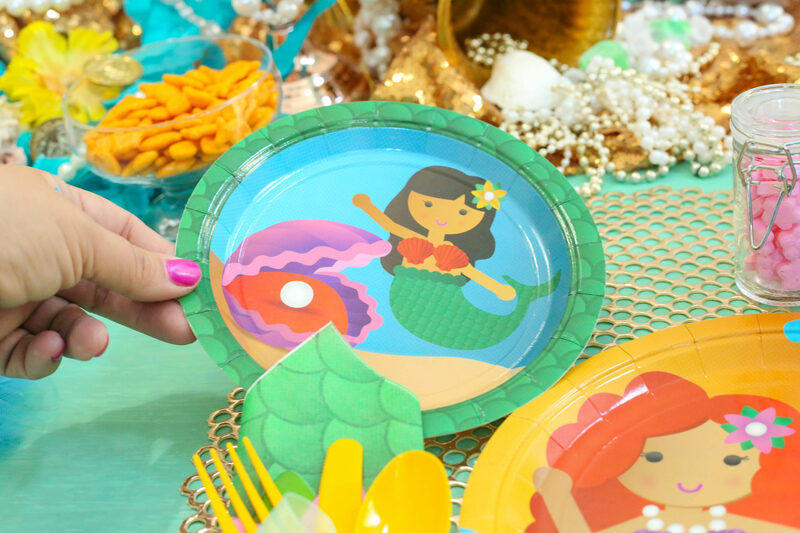 A mermaid with blazing orange-red hair adorns the darling luncheon plate, while the dessert plate features a second beautiful mermaid with dark hair and olive skin. 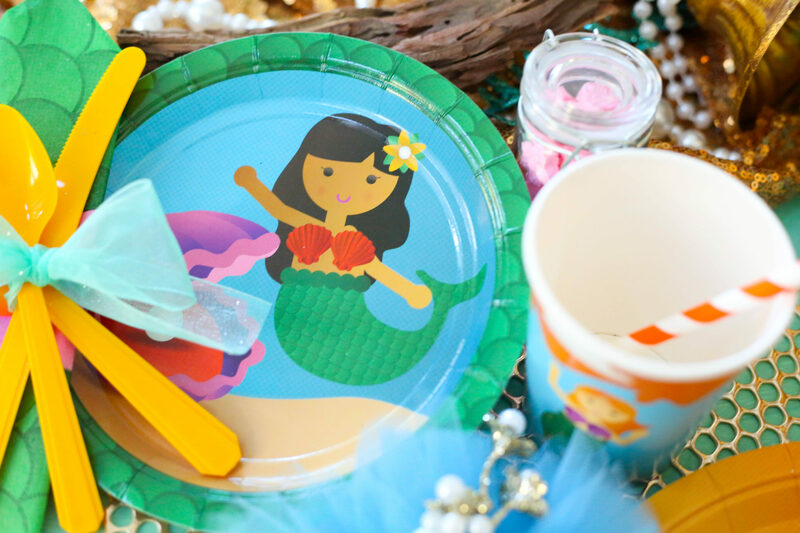 The party cups sport yet another stunning image of a dark-skinned mermaid, and it’s really impossible to tell which of the three is the loveliest of them all! Hold the Balloon offers the unique aspect of cultural diversity in this Splish Splash Bash tableware. What a welcome sight for young children to discover engaging characters like these. It’s certain to make each child feel special as they experience the immeasurable value of inclusiveness and recognition while celebrating with their friends. 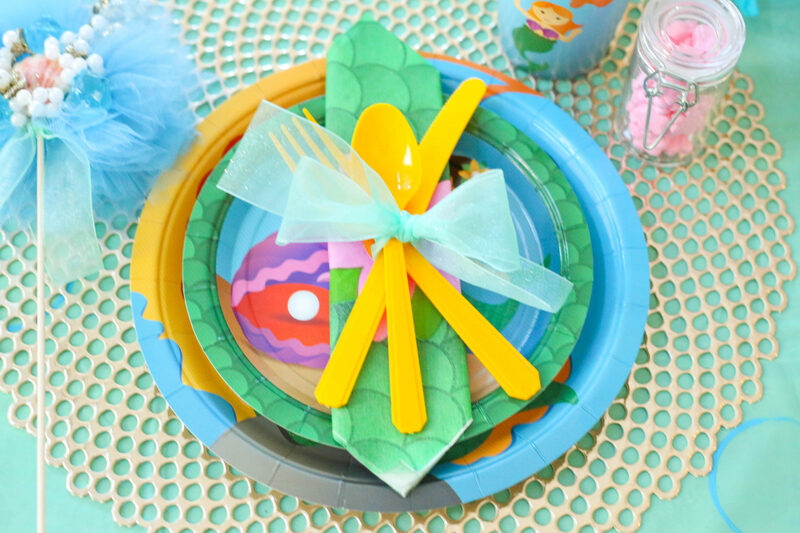 Bold yellow sunflower colored forks, spoons and knives are a fun and whimsical accent color to enhance the party table; each is tied elegantly with sparkling mint green sheer ribbon for a pop of contrast, and arranged atop Splish Splash Bash luncheon napkins. The napkins feature the same green scale pattern as in the plates, and also boast a bright and cheery orchid-colored flower accent in the center. 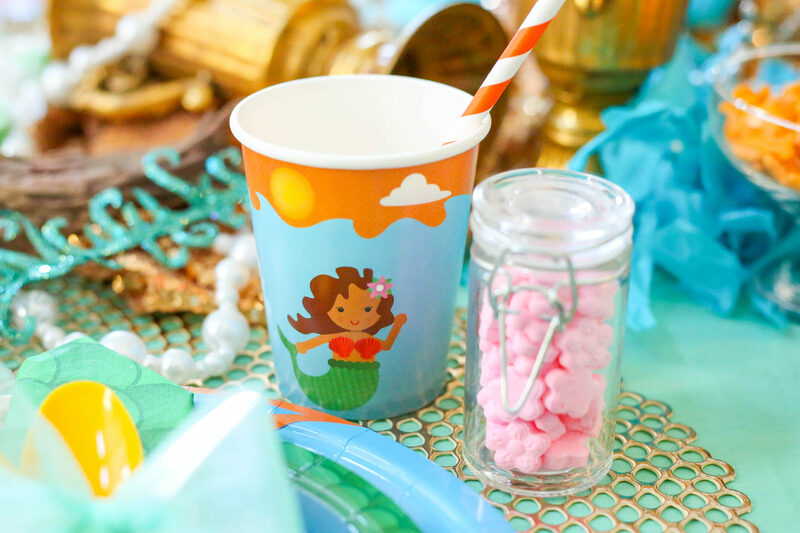 The Splish Splash Bash party cups are the perfect size for little hands, and are sturdy enough to be refilled throughout party time. They also make great snack cups, or ice cream cups! 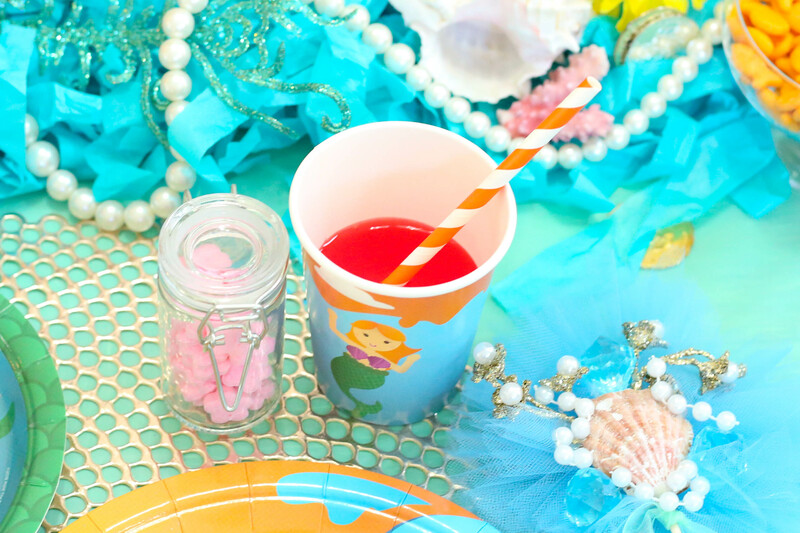 Mermaid sundaes would be adorable for a summer party as a cool treat for a theme party this cute. Cute flower candy favors in snap jars are a fun accent and echo the design from the napkin. Orange and white striped paper straws were placed in each cup, but you could also use gold, yellow, or pink! 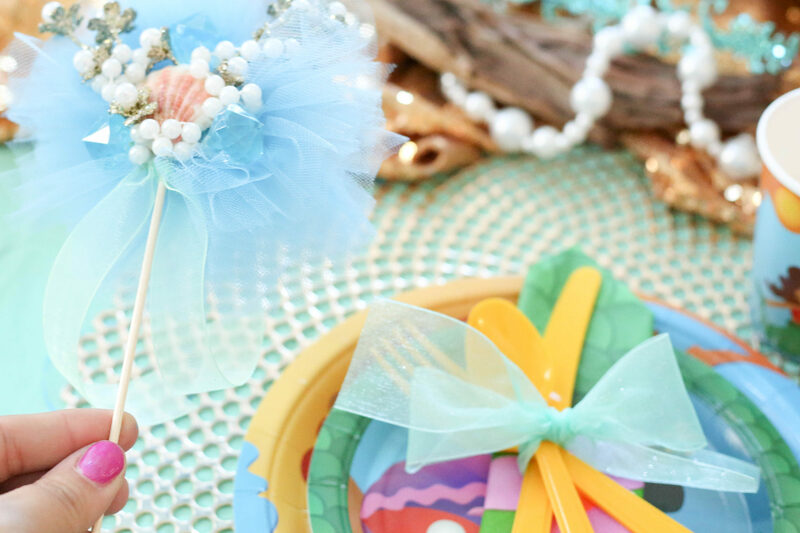 To add a custom touch to this mermaid party, a DIY tulle mermaid wand can be created for each party guest. 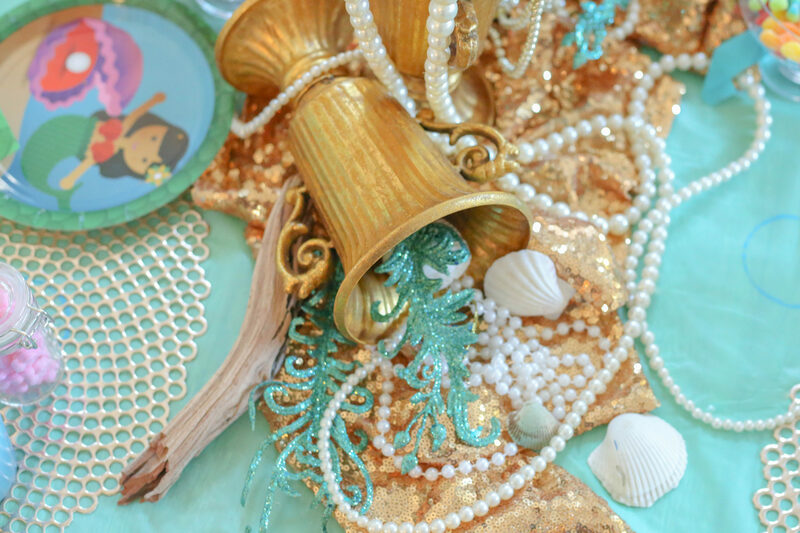 Each magical mermaid wand is layered with real seashells, swirling strands of pearls and glistening gems. 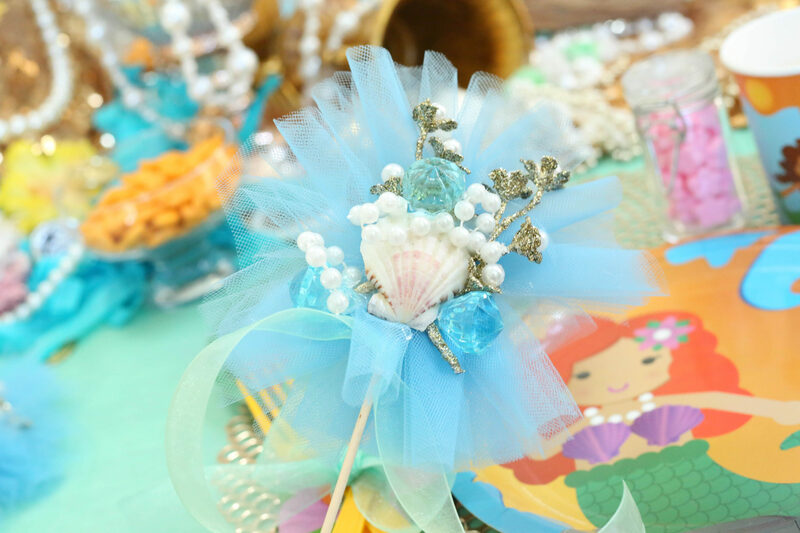 Party guests will certainly enjoy making all of their mermaid wishes come true with these beauties. 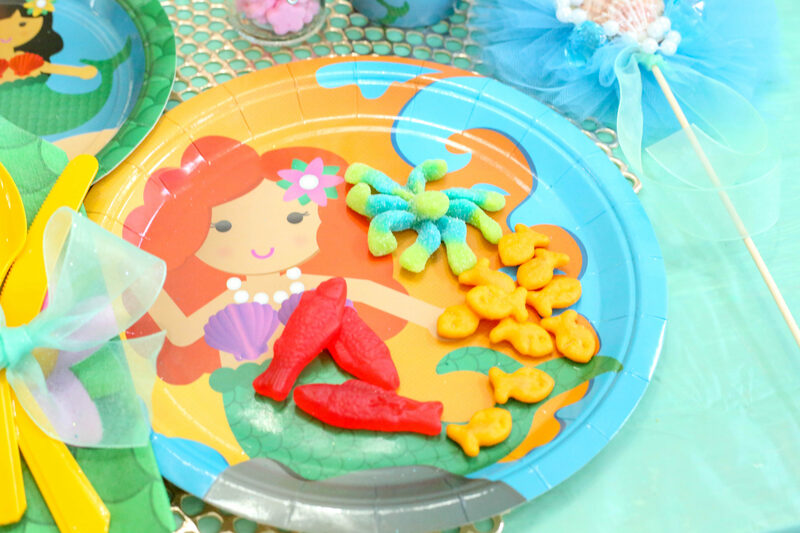 Some fun edible additions to a mermaid party theme are goldfish shaped crackers, red gummy fish candy, and sour octopus candies. These can easily be found at grocery or candy shops just about everywhere! Display the treats in footed glass bowls for an elegant look that fits the overall design nicely! 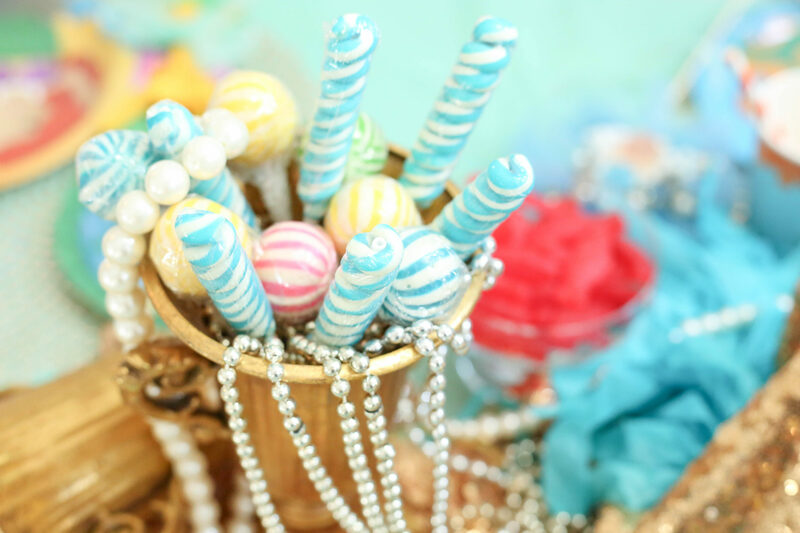 You can also arrange brightly colored candy accents in tall vases to bring whimsy and charm to the party tablescape. 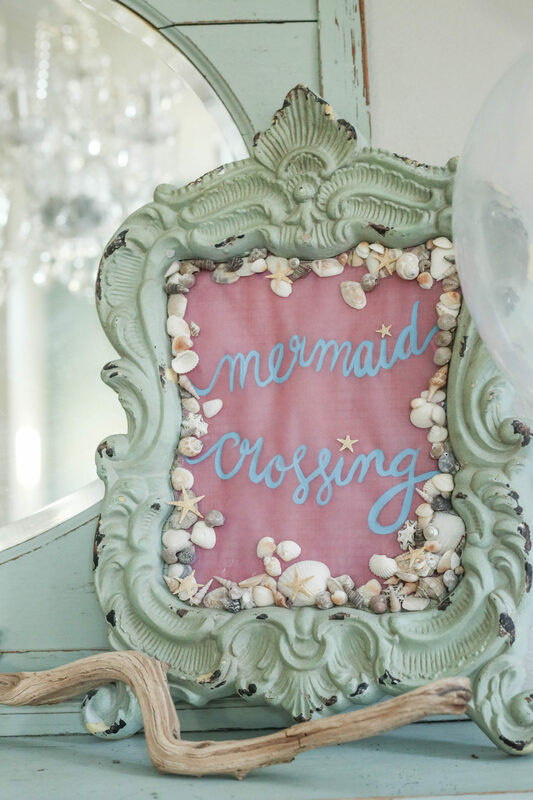 A few clear balloons and a “Mermaid Crossing” sign are lovely accents, as well. 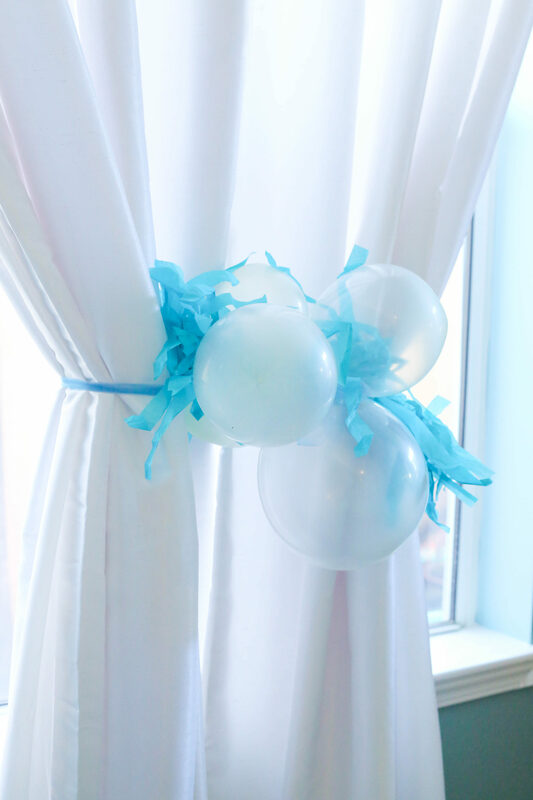 A cluster of clear balloons makes a clever curtain accent when tied on with a strip of blue tulle. Thanks so much for bubbling by this fun Splish Splash Bash! 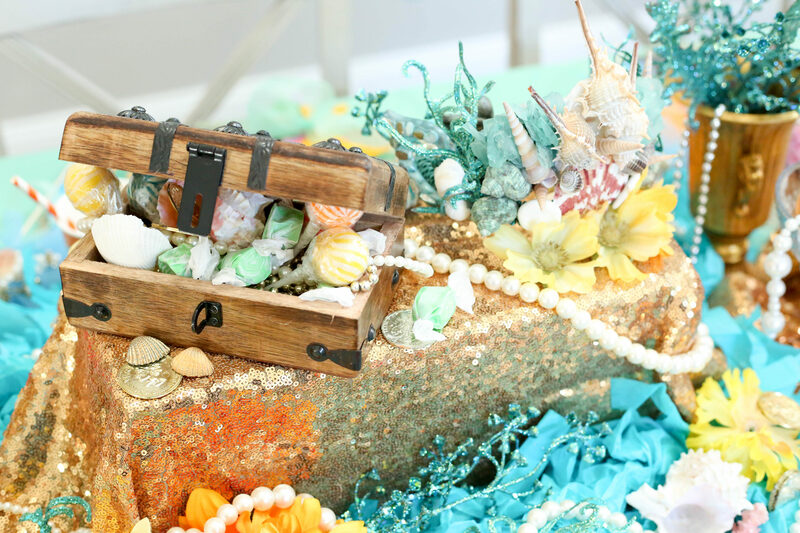 Hope you have found some sand-sational ideas for enhancing your own mermaid themed party.